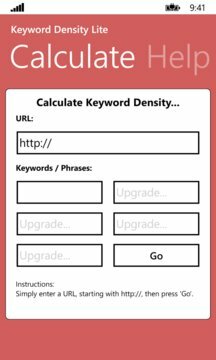 Calculate Keyword / Key Phrase Density on your Website, to aid your SEO efforts! Keyword Density will calculate the densities of desired keywords and phrases* on your web pages. • Lookup up-to 5 key phrases per analysis. • The "Body Word Count". 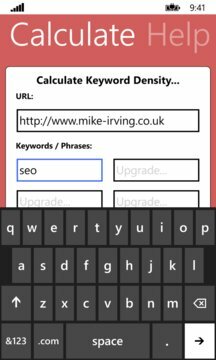 Search for 'Keyword Density' in the Windows Phone Store. The app is simple to use. Simply enter your Website URL, and your key phrase, to look for, the tap 'Go'. App Includes a Frequently Asked Questions (FAQs) / Help section.